Inspired by the awakening of my spirit to the synchronic order, I feel compelled and guided to build a 3-D synchronometer. * It will be called Nümi's Ark. * It will serve as my Galactic Timeship Interface Pod for the purpose of amplifying awareness. * Encoded within all aspects of its shape and form will be the insights and memories revealed to me through my study of the Law Of Time. 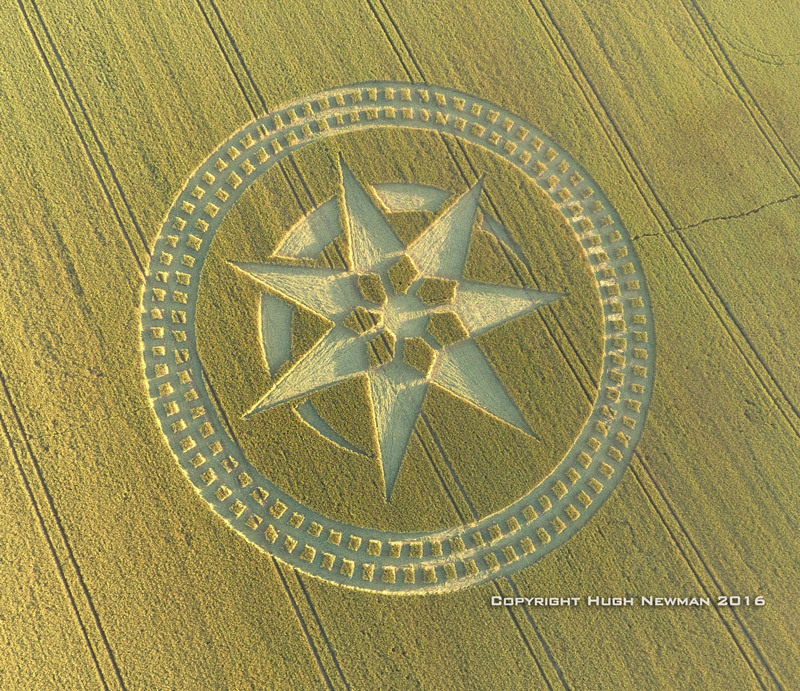 The above Crop Circle appeared nearby Stonehenge on 8 July 2016. I am a Yellow Rhythmic Star! Timeship Earth must not despair! Which heralds the return of cosmic norm! Prune and unwind the vines in your mind! For tomorrow dawns a most sacred Day Out Of Time!!!!! As my spirit is awakened I seek to know my true name. My galactic kin may call me Nümi. For the "new me" sees that "N-U-M-I (in you am I)". Salutations, With the intention of making conscious what was unconscious. It is ILLEGAL to us the LEGAL name. What is the biggest "Fib" of all? 204 is a refactorable number. 204 is a square pyramidal number: 204 balls may be stacked in a pyramid whose base is an 8 × 8 square. Its square, 2042 = 41616, is the fourth square triangular number. As a figurate number, 204 is also a nonagonal number and a truncated triangular pyramid number. Our thoughts are like waves crashing on the cosmic beach. Our minds can be prisons through which truth can leech. We must endeavor to sift out the broken shells from the sands of time. And see the beauty in the dawning of morning's first light. Hoy tenemos la oposición del Sol y Plutón, ambos a 16″ grados de signos zodiacales contrarios, Cáncer y Capricornio. Pluto, es el regente del infra mundo, de lo subterráneo. Dueño de la oscuridad y relacionado con el poder, la intensidad y las transformaciones. El Sol, la estrella que nos ilumina. Padre Sol, el que nos da la vida. Memory of the Divine Feminine...Restored... !